Last week I went along to Boudoir Beauty, near Shoreditch to have a Skinbreeze facial in order to detox my skin after a very busy December. I have had Skinbreeze facials before so I was very excited about my visit, my skin was feeling like it was in need of some TLC. 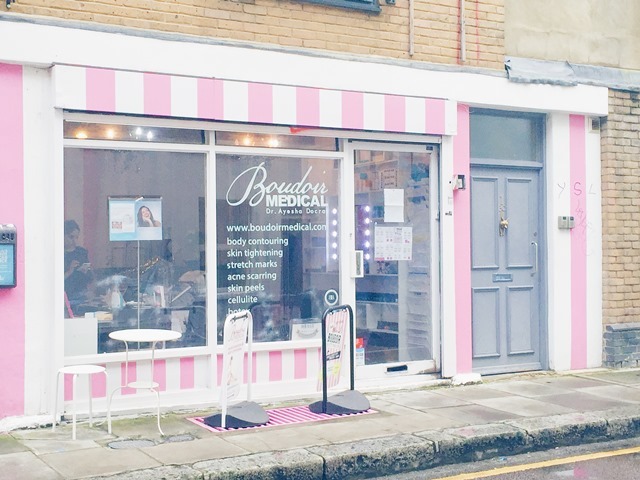 Boudoir Beauty Parlour is the perfect boutique like salon, it is pink on the outside so invites you in to a calm setting which oozes glamour. It has a small cosy feel and the staff are so friendly, you feel like a regular at the salon straight away. The treatment rooms are warm and relaxing, I’m sure I nodded off a couple of times during my treatment. My skin is always in need of an extra glow so I usually go for the rejuvenating facial but I also wanted some anti-ageing love. When the therapist had a closer look at my skin she suggested some acne fighting treatments as well because I had a few breakouts under the skin. She also said that she could do a combination of the three treatments as each treatment is bespoke to the client’s needs and current skin condition. The Skinbreeze facial treatments are the must-have skin treatment for celebrities such as Binky Felstead, Luisa Zissman and Roxanne Palette. I thoroughly enjoyed the entire treatment which is not invasive at all. Immediately after the treatment my skin looked brighter, felt super hydrated and smooth. The dark circles around my eyes had really faded. Of course I use the Skinbreeze serum in my beauty regime to keep my treatment topped up if you like. I would highly recommend this treatment to give your skin a detox and if you are in London, the Boudoir Beauty Parlour is a must, to visit.